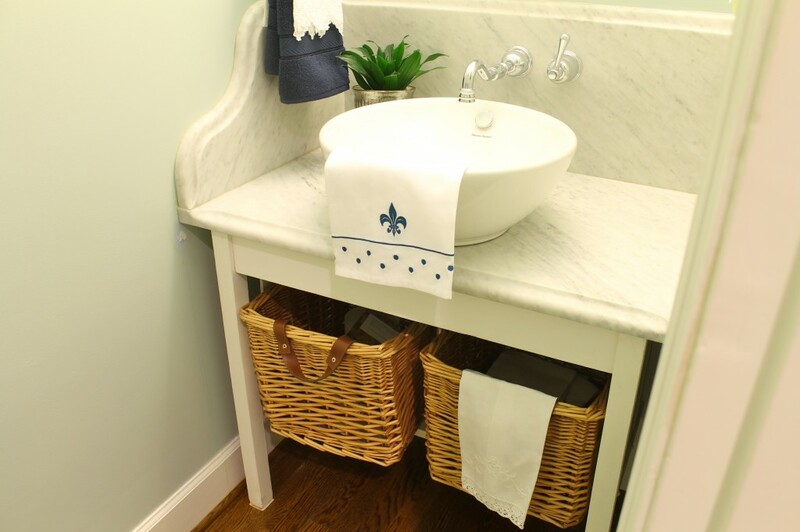 We have a teeny little powder room off of our foyer that has a wonderful vessel sink and marble countertop. I recently updated the room with some touches of navy. 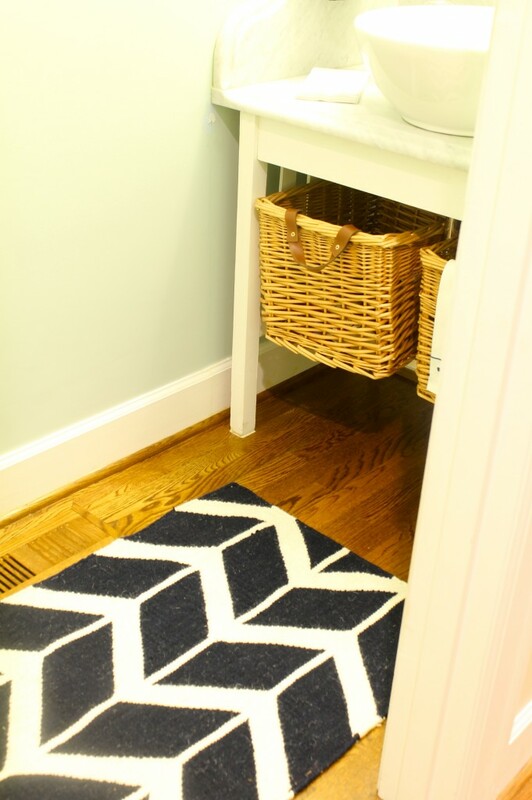 In that small space, a little goes a long way, and so, just a rug, a navy towel, and a French hand towel were all it took to get the job done. The room is pained the Benjamin Moore color palladian, and I love it. I had a Dash and Albert rug with stripes in here at first, but after seeing the wall color paired with navy in some magazines, I thought it might look nice in our house, also. When Jordan was here in late summer, we did some browsing in local shops, and I found this great navy and white rug in a store called Adele. I grabbed it as soon as I saw it and was thrilled to then find out it was on sale for 50 percent off. Score! The only other purchase I needed to make to freshen the look was this navy towel which I layered under a white linen towel that I owned. 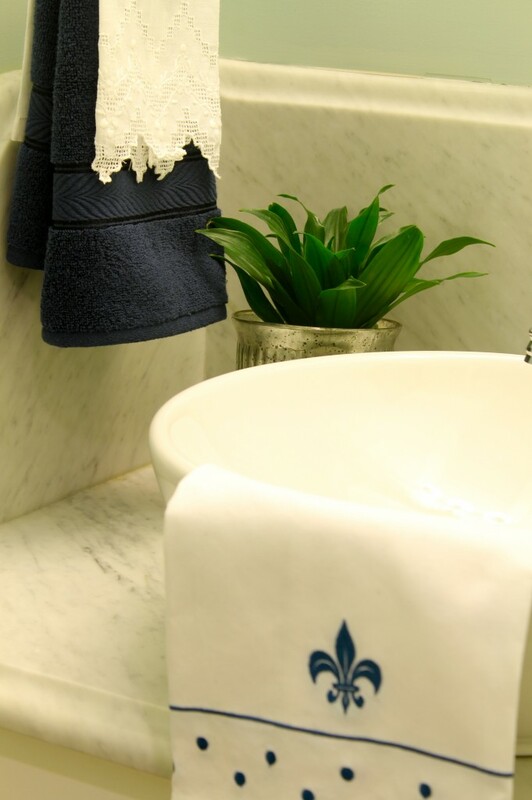 I already had the fleur de lis towel on hand and just added it to the mix. You can see from this photo that the room isn’t very wide at all. Less is definitely more in here. What you can’t see because it is impossible to photograph is on the opposite wall. Last year when I was at a Paris flea market, I bought an advertisement that had been in a French 1950’s fashion magazine. The ad showcases an elegant lady sitting in front of her mirror in her dressing room. The colors in the ad include both navy and a color that is close to the wall color. It is a charming “print”, and I framed it and hung it in this room. This sweet little print is right below it. This print hung over my bead during my entire childhood. At least it did until the Beatles came along, and then I taped a photo of the Fab Four on top of the ballerina. I think my mother bought it at the Benjamin Franklin Five and Dime for a dollar. I love having it in my home now. It is framed similarly to the Parisian lady, and the two are a good duo. 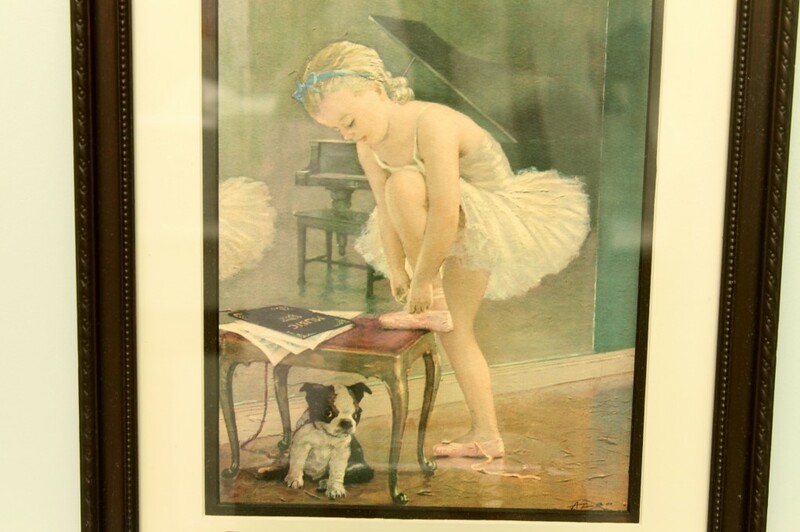 I think this ballerina is very French also, don’t you? I love the fresh look for fall. 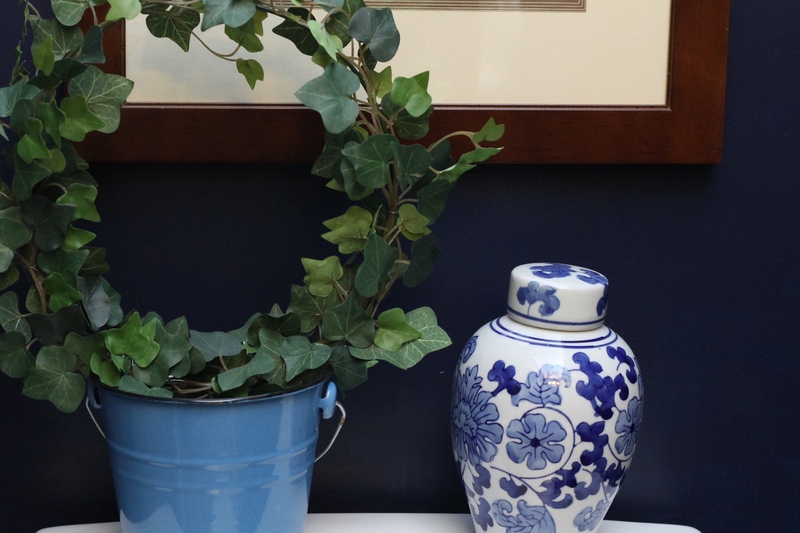 The navy blends in so well with the navy that is in the rest of the house, and the powder room is now on the same page with everything else. Thank you so much for stopping in. Such a pretty little room! I love the new artwork. 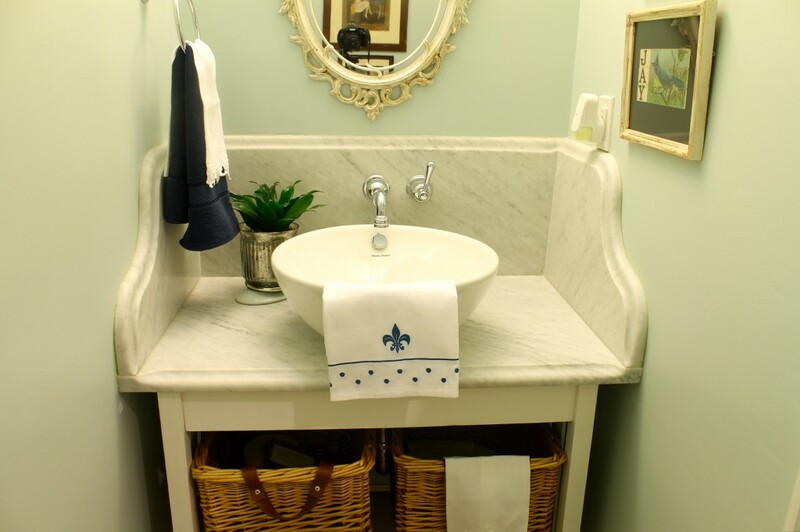 Such a beautiful powder room…love the marble…and the artwork is exquisite…great rug and always love that navy combination! !…Have a great weekend!